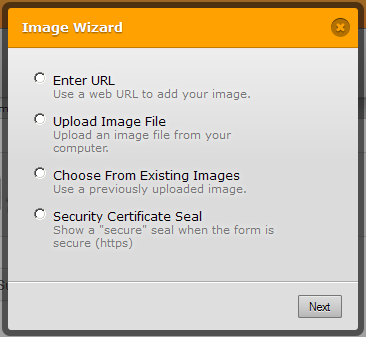 To do that you should add the Image tool from our Form Tools. Once you add it to your jotform you will be able to select one of the options you prefer to get the image on to your jotform. If you have any questions or need assistance just let us know and we would be happy to help. Thank you Ben. I had tried that and wasn't able to access the second menu from the Form Tools menu when clicking on "Image" nothing happened (using Internet Explorer as my browser). I finally switched to Firefox and was able to get it done. I'm not sure why I could do it from Explorer. Appreciate your fast response. I tried checking on different version of IE browsers (8-11), however I was not able to replicate the problem. Can you share with us the version of your Internet Explorer? You may also want to clear your IE browser's cache if in case some scripts failed to complete when loading the page. I'm using IE 11. I've had no problems in the past and I asked the question because I couldn't remember if I was doing something incorrectly. My Browsing history is deleted upon exit. This morning it worked one time after turning the computer off. I did another test after manually deleting browsing history. It would not bring up the next menu a second time. I clicked on 'image' 3 times with long pauses in between. I finally clicked continuously about 6 times in succession and the next window came up. Not a big deal now that I know to just go into Firefox and bring it up. I haven't tried from a different computer. Thanks again. Thanks for sharing your case, BeverlyNolan. This indeed is something unusual. But your story will help us to be able to try replicating the problem and hopefully resolve issues in IE browsers. Feel free to let us know further if you have other questions or concerns regarding anything JotForm.